We specialize in laparoscopic gynecology, urogynecology, pelvic surgery, infertility treatment and management and aesthetic vaginal surgery or vaginal rejuvenation. We perform complete workups for referring doctors and private patients. Most of our surgeries are quick, outpatient, or just overnight stays. Our armamentarium offers the latest-in-town aesthetic rejuvenation to our patients. We are proud to be the first centre in South India to offer this service and we stand as the premier Aesthetic Vaginal Surgery Institute in Chennai. 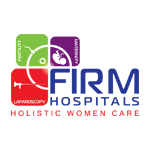 Firm Hospitals stands as a one stop Women’s Health Center. Our surgical sub-specialty is unique in that it enables one physician, (Dr. Mala Raj) to integrate the skills of a gynecologist, urologist, fertility specialist and aesthetic surgeon. Under the same roof along with secure communications and a fast-acting rapid response team, Firm provides the untouched and sophisticated laparoscopic surgery and infertility treatment.